Habit: Perennial herb, glabrous. Stem: erect, 20--120 cm, branched. Leaf: crowded, < 60 mm, lanceolate to ovate, rigid, +- clasping, tip acute to long-tapered. Inflorescence: dense to open; pedicels 1--13 mm, +- = bracts. Flower: calyx 2--12 mm, lobes linear to triangular-ovate; corolla 20--50 mm, yellow, lower lip closing throat, densely white- to orange-hairy; stigma lobes 0. Fruit: 3--7 mm. Seed: +- 1.2 mm, +- pyramid-shaped, ridged. Chromosomes: 2n=12. Ecology: Roadsides, fields, open areas in yellow-pine forest, pinyon/juniper woodland, sagebrush scrub; Elevation: < 2080 m. Bioregional Distribution: NW (exc NCoRH), CaR, n SN, GV, CW (exc SCoRI), SW (exc ChI, SnJt), GB (exc Wrn, W&I); Distribution Outside California: widely naturalized; native to Mediterranean. Flowering Time: Apr--Sep Note: Other subsp. Oregon, Washington, eastern United States. Synonyms: Linaria genistifolia (L.) Mill. subsp. dalmatica (L.) Maire & Petitm. 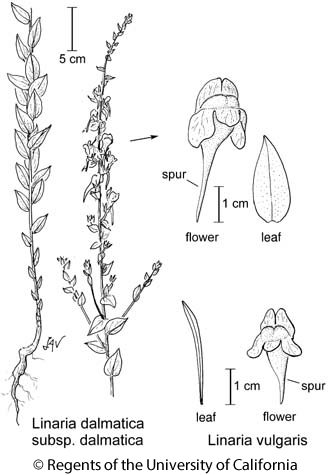 Citation for this treatment: Robert E. Preston & Margriet Wetherwax 2012, Linaria dalmatica subsp. dalmatica, in Jepson Flora Project (eds.) Jepson eFlora, http://ucjeps.berkeley.edu/eflora/eflora_display.php?tid=51304, accessed on April 21, 2019. NW (exc NCoRH), CaR, n SN, GV, CW (exc SCoRI), SW (exc ChI, SnJt), GB (exc Wrn, W&I); Markers link to CCH specimen records. Yellow markers indicate records that may provide evidence for eFlora range revision or may have georeferencing or identification issues. Purple markers indicate specimens collected from a garden, greenhouse, or other non-wild location.